Mixing bowls are an essential component of any kitchen, performing a wide variety of jobs like a jack of all trades. From mixing ingredients to storing leftovers, they are one of the most versatile, and overlooked, pieces of kitchen equipment. Fact is, many people fail to realize just how many different types and sizes there are- or all the ways they can be used. 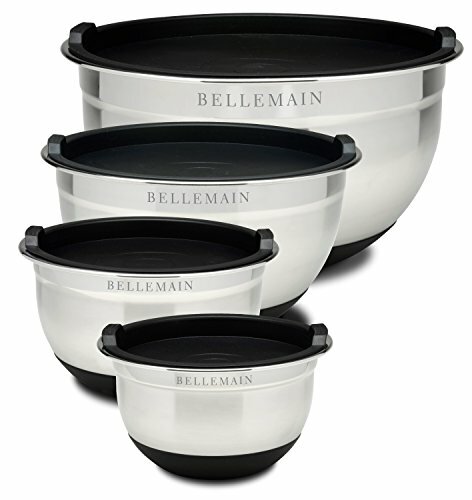 To help you out with this, I put together this Best Mixing Bowls buying guide. I will give you a breakdown of the various styles, sizes and uses of mixing bowls, how many you should have and a list of the 5 best mixing bowls for your money. So read up before you whip up that next cake (and be sure to send me a slice). 5 Top-Rated Mixing Bowls for Baking– Which One is the Best? 1 5 Top-Rated Mixing Bowls for Baking– Which One is the Best? 2 What are Mixing Bowls Used for? This set is a smart choice because it has a variety of sizes and extras that make it great for storing and mixing. There are 4 glass bowls in this set: a 1-quart, 1 ½-quart, 2-quart and a 4-quart, and each comes with its own lid for easy separation and storage. The glass is microwave, oven, freezer and dishwasher safe so you can use them for just about anything and the plastic lids are BPA free, so they’re good for the environment. Great for keeping leftovers, traveling to school or work and basic mixing needs, this set can handle jobs big and small. These high-quality, durable bowls are some of the most versatile on the list and they are a bargain for bakers. Each bowl has marked measurements on the inside, so you can pour and measure at the same time. This is really convenient and a big plus for bakers. They also have silicone coated bottoms, so they won’t move while mixing- another plus. There are 4 sizes in the set: 1-quart, 1.5-quarts, 3-quarts and 5-quarts, so they can be used to prep large meals, and each one has a BPA free silicone lids, so they can be used to mix and store. Dishwasher and freezer safe, they won’t rust and the stainless steel is made to last. A must for any serious cooks. If you are looking for a bowl that can handle larger than average jobs or have a KichenAid mixer then this is a wise investment. 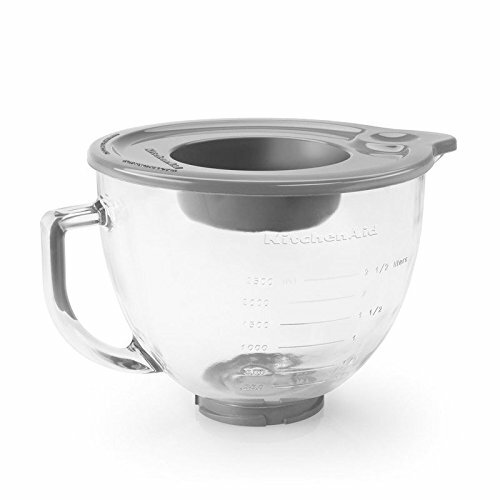 This glass bowl fits select KitchenAid models (KSM150PS, KSM152PS and KSM155GB) in place of the standard metal one. Designed with your convenience in mind, it has a wide handle and a spout for pouring, nice for muffins or quiches. There are also measurement markings from top to bottom for precise mixing and it can go in the microwave and freezer– so you can use it to hold batter or melt chocolate. It comes with a fitted lid and is good for families who like to whip up tasty treats. Looking for a mutli-purpose mixing set that won’t break the bank? 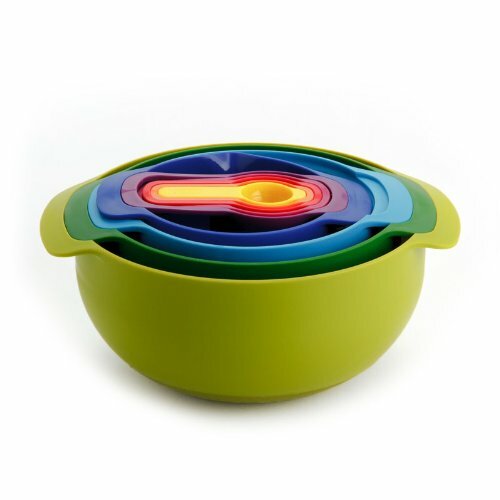 Then check out this stackable set of bowls from Joseph Joseph that will cover all your kitchen needs. This set, made from plastic and featuring a non-slip base, features 9-pieces, including: 10.5-inch mixing bowl, 9-inch colander, 7.5-inch sieve, 6-inch bowl with a spout and measurements etched on it, 1/4, 1/3, 1/2, and 1 cup measuring cups and 1 Tablespoon. That means you can use these bowls to mix, drain pasta, sift flower and measure ingredients, practically eliminating the need for any other utensils. Plus, they are BPA free and dishwasher safe, making clean-up quick and easy and this set a must for any kitchen and a great value for your money. 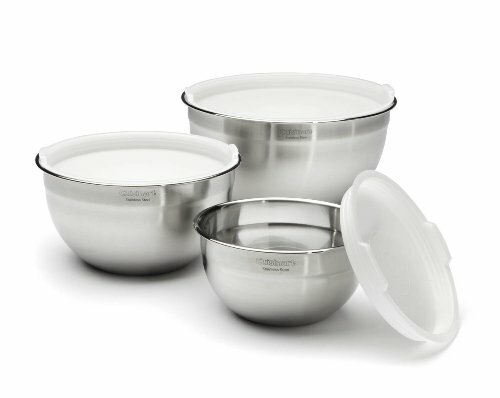 These stainless steel bowls are perfect for grillers because of how well they marinate foods. Freezer and refrigerator safe, you can season meats overnight for intense flavor or chill fruits for a summer salad. Dishwasher safe, they have lids and make great serving dishes and storage units. What are Mixing Bowls Used for? Mixing bowls are the one tool I cannot live without, handling a multitude of jobs when a regular bowl just won’t do. Among the various jobs they can perform are: mixing ingredients, marinating meats and fish, acting as a serving dish for salads or snacks, holding leftovers and even freezing food portions. What they do sometimes depends on size and the materials they’re made of (more on that in a second) which is why it’s good to have a variety of different ones. But no matter which ones you have, they are guaranteed to make preparing and serving food a lot easier and also helps cut down on clean-up. 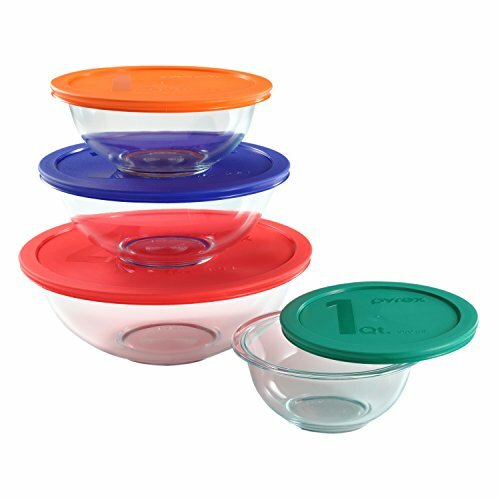 • Plastic: plastic mixing bowls are great because they are lightweight and almost impossible to break. They come in hard and soft plastic, and can go anywhere, so you can take them on a trip to the beach or use them to marinate chicken. On the down side, plastic bowls have a tendency to absorb odors and oils, which they can transfer to other foods, so use them for salads and dry ingredients. Also, they can melt if left near hot surfaces. Q: Are mixing bowls microwave safe? Yes, most of plastic and glass ones do. Ideal for: salads, storage, dry mixing. • Metal: these are my personal favorites, because they are durable, easy-to-clean and can be used for as variety of tasks. Most are microwave safe and can retain hot and cold, keeping foods hot/cold for longer, making them great for serving meals out of. The major downside with metal is that they scratch easily if you mix with metal utensils, so it’s best to use plastic (no whisking!). • Glass: Glass bowls are a bit heavier and more fragile than plastic and metal; They work best for making yeast rise, as plastic and metal often have an adverse effect on the active ingredient in yeast. They also do not react with foods, so it will not affect the taste. The big negative here is they can chip and crack, which can make them expensive to replace and possible dangerous. Ideal for: baking, mixing, marinating, chilling. • Ceramic: Ceramics hey are unique, with intricate designs that make them perfect for serving salads, pastas and more. They are quite heavy, so they remain stable on any surface, making mixing easier and some can go in the oven or microwave. The one thing to be wary of when it comes to ceramic is they can stain easily and are prone to chip. Plus, they can be a bit expensive, so use them wisely. Ideal for: serving, dry mixing. • Wooden Bowls: Perfect for salads, these bowls are quite pretty, with the added bonus of being porous. Being porous is a good thing, as it will soak up salad dressing and oils, adding to the flavor each time you serve a salad. The downside is they are limited to salads and are too fragile and prone to absorbing juices for other uses. • Copper: These bowls are very expensive, but great for beating eggs, as the copper reacts with the egg white to stiffen and stabilize. They are limited in usage, but good for meringues and other delicate dishes that use egg. Ideal for: beating egg whites, serving chilled foods. •Use: what do you plan to do with your mixing bowls? If you bake a lot you will want to invest in some glass styles, and if you plan to use them for storage or to take food to work you’ll want ones that come with lids. You need to figure out how you plan to use them so you can buy the right ones. •Size: the size bowls you buy are also important. For instance, if you make large quantities of food or have a large family you may need quart-size bowls to marinate or store left-overs. Ideally, you should have varying sizes for any situation. •Price: some materials, like ceramic and copper, can be very expensive, so make sure you buy what you can afford. Getting one ceramic bowl when you need 3 is not helpful, so choose wisely. • Use them to prep meals for the week, storing the pre-made food in the fridge and labeling them for easy to make meals after work or school. • Make and freeze meals, sauces or cookie batter, then pull them out when you want a late-night snack or have a craving for sauce. • Use individual size stainless steel or plastic bowls as sundae dishes; you can also fill small plastic bowls with sundae toppings and make a buffet for kids’ parties or fill with salad toppings at the next family party. 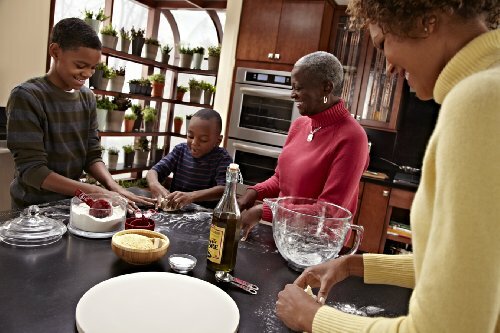 • Take various sized bowls to separate ingredients in recipes that call for them to be mixed separately. • Use 2 different size steel bowls, stacking one on top of the other to create a double boiler: fill the bottom one with hot water and the top with chocolate to melt it. Preheat oven to 350°, grease one mixing bowl with butter and flour to prevent the cake from sticking and put to the side. Combine cake mix, water, oil and egg whites in the other mixing bowl, following the cake box directions. Pour cake mix into the greased and floured bowl and bake for 40-50 minutes. Insert toothpick to see if cake is done: if toothpick comes out clean, the cake is ready. This recipe works great in a glass or metal bowl, as you can prepare and chill it in the same bowl. Cook pasta as directed on the package, drain and place in one of the mixing bowls to cool for 10-15 minutes. When cool, add the romaine lettuce, bacon and tomato. Drizzle the ranch dressing and barbecue sauce over the top, then gently toss to coat evenly. Season with pepper. Can be served immediately or placed into the refrigerator to chill. 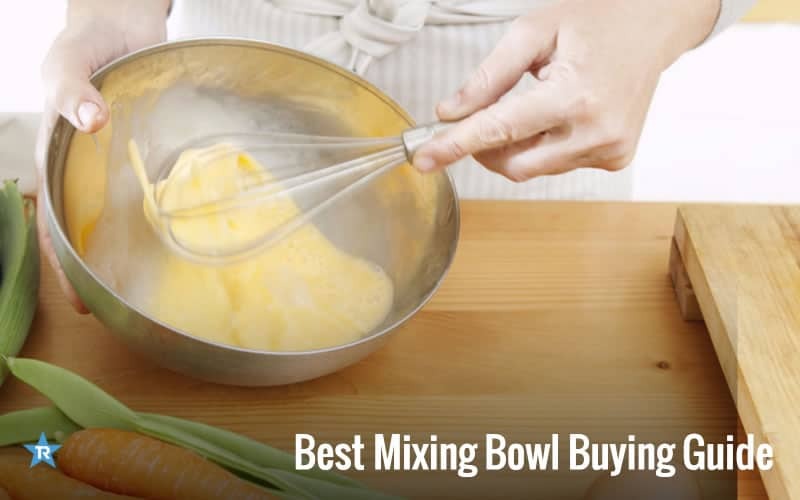 As you can see from my best mixing bowl buying guide, all mixing bowls are not created equal. With a vast assortment of sizes and materials on the market, they can go from the kitchen to the table, making them the go-to tool in any kitchen. From pretty ceramic bowls to no-nonsense plastic ones, there is a bowl for every job. 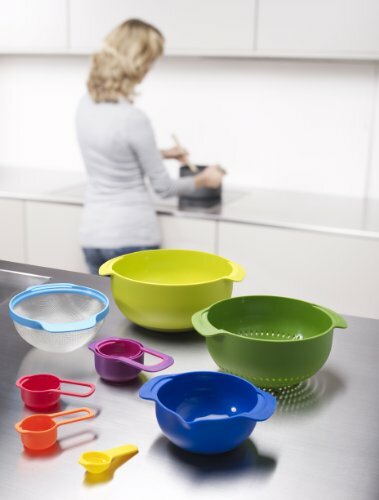 Mixing bowls make baking, marinating, prepping and anything else you need to do easier, quicker and hassle-free. They can be used over and over, are easy to clean and can help you put together the perfect meal or treat. Use them to soak meats in savory sauces or blend ingredients to whip up a soufflé. No matter what you do, one thing is for sure: these bowls will never sit on you shelves collecting dust.